Cutloose Climbing: Boogie Nights Repeated! 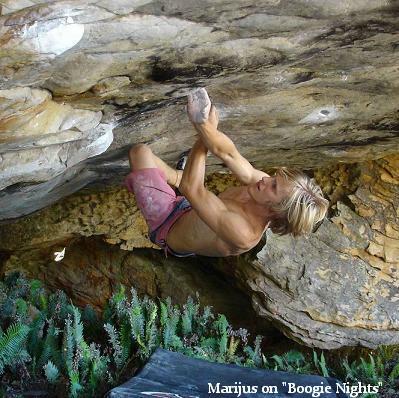 Marijus Šmigelskis has made the long-awaited 3rd ascent of "Boogie Nights" 8A+ at Topside. The problem was opened by Justin Hawkins in 2000 and had only been repeated by Swiss superstar Fred Nicole. Marijus worked the line over 3 days to build up enough stamina to then send the 18 move roof. Amazingly, the problem then saw it's next ascent the very next day with Emile Esterhuizen, who worked the problem with Marijus, grabbing the 4th ascent.